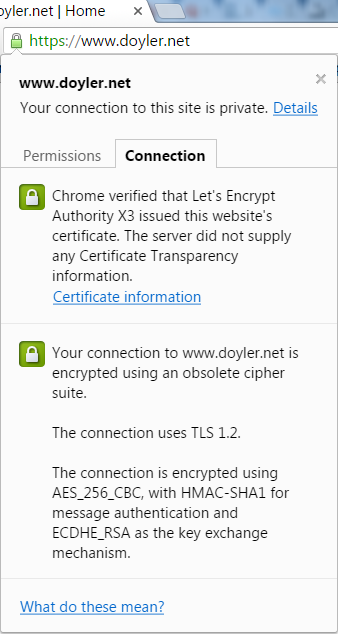 Continuing with the theme of improving my website and hosting, I transferred my domain to Google and setup a Let's Encrypt certificate this past week. Inputting the domain to transfer to Google was even easier than expected, with a nice entry box on the home page. Once I entered in my domain name, they told me what steps I would need to take to get it transferred over. After I got everything filled out and the form submitted, I even received a confirmation e-mail to verify that I did want to transfer the domain. Once I submitted everything, it took about 5 days to get the domain completely transferred over, and managing it is even easier now. I would recommend Google as a registrar if you are looking for one though. They are $12/year with free privacy and e-mail forwarding included. When the domain transfer was complete, I also setup a Let's Encrypt certificate so that I would have SSL for the logins etc. As I'm running Apache, I was able to use their auto-installer, which made everything a breeze. Receiving objects: 100% (34858/34858), 9.31 MiB | 4.62 MiB/s, done. e-mails sent to dev [at] doyler.net. If you notice in the screenshot though, I did mess up by not including the www. initially, which caused some problems with the cert not matching the URL (due to my rewrite). That said, I regenerated the cert for www.doyler.net and removed the one without the www. and it solved that problem. 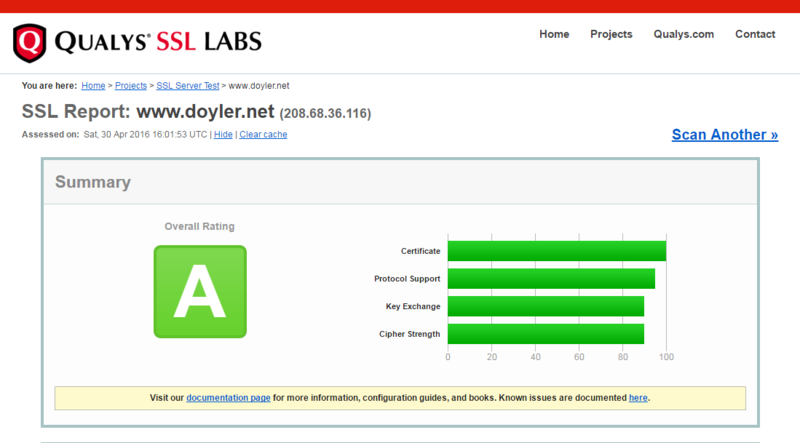 As you can see in the top corner now, the SSL cert worked and all major browsers trust it! Additionally, I ran the site through an SSL test to make sure that everything was sound, and it came back with flying colors. The last thing I did was setup my http.conf to redirect all traffic to the SSL site, to force all traffic to be encrypted. Ah, I hadn’t tried one of those yet…that’s too bad. Hopefully soon!